What models exist and what are they running? Looking for bolt guns mainly. Or what will it take to convert say an M38 to .308? I the the Enfield 'jungle carbine' is available from time to time in .308 and is C&R. I believe the spanish FR-8 is a mauser based .308 C&R. Also, some FN-49 variants. Didn't the Israeli's convert some mausers to 7.62x51? I had a Spanish FR8 once, I was amazed at how accurate it was for a carbine. i have a mauser 98 made by steyr for chile in 7x57 . in the 60s chile converted them to 7.62x51 with modified springfield 1903 barrels and modified magazines. these are very nice. Quite alot of C&R in .308....but most of them are pricey. DCRA Converted No4's from Canada. All of these are very pricey and fairly uncommon, but they are C&R. There are also some Spanish Mausers in .308. Thanks All. Time to do some looking. 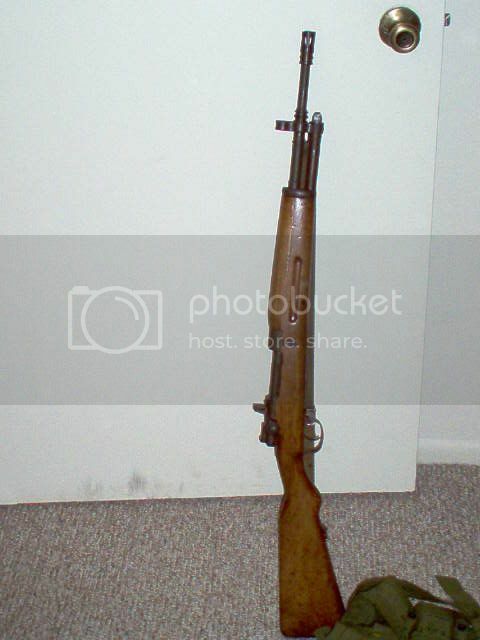 crappy pic but for the $$ its this or an enfield! and i lik ethese alot better than an enfield. Is that FR-8 semi-auto? Awsome looking gun. Stay away from the .308 FN-49 rifles from SOG. Bad conversion. Would Israeli Mausers be C&R anyone know anyone selling them? The Indian 2A and 2A1 rifles are not hacked together. These rifles were made with a higher grade of steel than the earlier Indian SMLEs made in .303. These two rifles may the best permutations of the greatest bolt action MBR ever made. Yes, the Israeli .308 rifles are C&R. There are several common versions. You have the recycled Czech VZ24 receivers that often have the Czech rampant lion on them. I have seen Israeli .308 rifles made from recycled NAZI-marked K98k receivers (and many with WaA-marked parts). Also, you will find the FN-made Mausers (intermediate length actions) that are in .308. In the 50s and 60s, these rifles were rebarreled into .308. Virtually all of them are on 50 year old receivers, so they are unavoidably C&R. As for the effect of modifications on C&R rifles. If the rifle's receiver (the "legal" part of the firearm) is at least 50 years old, then it doesn't matter what modifications you make to it as long as they are legal for any firearm. For those C&Rs that are less than 50 years old, modifications can cause them to lose their C&R status. For example, a C&R missing parts is considered a C&R. Century has shipped many thousands of UFixEms in this condition as C&Rs without any legal problems. It is no secret to ATF that CAI does this. However, when you start adding non-original parts to a C&R less than 50 years ago, you begin to change its status. If you take a GEW98 and replace its barrel in a non-original caliber but maintain its outward appearance, you are likely getting into an area that the ATF really doesn't care about. However, turn a younger C&R into some sort fantasy sporter, and it won't be C&R anymore. The ATF has many rules. I imagine they have many more than they have the time, resources, and interest in vigorously enforcing. Minor changes in C&R weaqpons and the now ridiculous enforcable 922(r) are two of them. I am not advocating breaking any laws. I'm just saying that flauting the law will bring you grief while minor statutory infractions are not worth losing sleep over. Guys, 9-11 changed everything.....and I mean everything. Mainly, when he talks about younger C&R he is referring to the SKS, which when you start throwing on a Pistol grip, detatch mag and folder becomes and assualt rifle and falls under those laws and will lose its C&R status. THe chilean M1912 (model 98) mausers are nice. I'm not sure they changed the magazine or barrels though. The mags wouldn't have to be touched to feed 7.62nato. Judging by mine I'd say that they pulled the barrels, re-chambered and bored and re-installed them back on thier original recievers. I got mine in "good condition" It's all matching and the bore is immaculate (two groove as well) if you could get one of those I'd say go for it. They're also deadly accurate adn make a handy, slick little backup or truck gun while hunting. the short rifles had a 2 groove barrel that was a surplus 1903 barrel. most of the mags got a feed ramp soldered into them. and that styer 1912 action is smooth. the 1912 long rifles were rebored and had a new chamber soldered into place. the short rifle conversion was of much better quality. Yeah, I sold mine years back, I could kick myself.